More barbs were thrown at Health Savings Accounts this week during a hearing chaired by Senator Larry Craig of the Senate Special Committee on Aging. Robert Greenstein, executive director of the Center on Budget and Policy Priorities, said in his testimony that MIT economist Jonathan Gruber has produced research showing that enhancing HSAs would actually increase the number of uninsured. Greenstein was criticizing a Bush administration proposal that would allow HSA purchasers to take a tax deduction for the cost of the health insurance that they must purchase in order to open an HSA account, with Gruber saying 350,000 more people would lose coverage if the new tax deduction were enacted. What kind of backward economics is this? How can adding a new incentive for people to purchase insurance mean that more people would lose their coverage? Because, Gruber?s thinking goes, employers will quickly dump their current health insurance if their workers have another option. Fortunately, Kate Sullivan of the U.S. Chamber of Commerce was at the hearing to set the record straight, arguing that HSAs and tax incentives will augment, not undermine, employer coverage. Aetna President Ron Williams said that employers are welcoming HSAs and other consumer-directed plans because they provide a new, lower-cost option that incorporates incentives for employees to be better informed about their health and their health spending. ?Ultimately, we believe this engagement will also have a positive effect on both health status and quality of care,? he said. NCPA President John Goodman offered a discussion of the economic fundamentals of HSAs and a list of 10 advantages; click here to read his testimony and that of the other witnesses. Dan Perrin and Richard Nadler of the HSA Coalition have produced the definitive study showing how off-base Gruber is: ?It is counter-intuitive to believe that a policy which lowers the price of a service will reduce demand for that service,? they write. Their own analysis shows that an HSA premium tax deduction would mean an additional 1.8 to 4.4 million Americans would gain health insurance. It would be just ever so helpful if critics of HSAs would actually pay attention to the data instead of their predictions. And there are new studies that build on the positive results from the Galen Institute?s February briefing. ?HSAs are only for the young…? Assurant Health, a national health insurance carrier that focuses on individual and small group policies, has found that more than 70% of its HSA purchasers are over age 40. In a study Aetna conducted earlier this year, it found that the age and family status of customers enrolled in its consumer-directed health plans (sold mainly to larger employers) reflected the general population. ?HSAs are only for the wealthy…? Data from the on-line brokerage company eHealthInsurance shows that nearly half of HSA purchasers make less than $50,000 a year. Assurant found that 27% of its HSA purchasers have a net worth of under $25,000. ?HSAs are only for the healthy…? Wrong again. Only a small percentage ? 6.1% in Assurant?s study ? weren?t able to buy coverage, meaning that 94% were. ?People won?t go to the doctor…? Assurant found that preventive care office visits were up by 31% with consumer-directed accounts, consistent with earlier findings by Aetna. ?HSAs mean more people won?t have health insurance…? eHealthInsurance found that 56% of those purchasing HSAs with incomes under $15,000 were previously uninsured, and 46% of those earning $15,001 to $35,000 didn?t have previous coverage. Assurant said that overall, 40% of its HSA applicants were previously uninsured. And to top it off, eHealthInsurance found that 71% of those purchasing HSAs paid less than $100 a month for their insurance premiums. Finally, I?m in Princeton, NJ, attending a conference focusing on disease management, sponsored by the Council on Health Care Economics and Policy. It continues to confound me that people find so many individual pieces of the Medicare bill to like yet the overall bill continues to be hammered by both the right and the left. Authors: Donald J. Palmisano, M.D, J.D., David W. Emmons, Ph.D., and Gregory D. Wozniak, Ph.D. The president of the American Medical Association, Dr. Donald Palmisano, renews and updates the organization?s health reform agenda in this JAMA article, calling for three fundamental reforms to increase the number of people with health insurance and build a patient- and doctor-centered system. First, ?replace the tax exclusion of employment-based health insurance with tax credits that are inversely related to income, refundable, and advanceable.? Second, allow new forms of group purchasing arrangements that ?will enable better matching of insurance benefits with the values and preferences of individuals.? Finally, encourage insurance market reform. The result: A gain of 16.2 million to 26.2 million in newly insured individuals at a cost of $39 to $65 billion in new federal spending. Wharton Professor Mark Pauly was invited to respond in an accompanying article, ?Keeping Health Insurance Tax Credits on the Table.? He commends the AMA for the new ideas they have added to the debate, such as ?allowing, and even encouraging, governments at all levels to make collectively chosen and publicly managed plans available to holders of credits, along with private insurance plans.? Pauly concludes that the AMA proposal advances the debate, diminishes the ideological divide, and keeps tax credits on the table as a viable solution. ?The Medicare Prescription, Drug, Improvement, and Modernization Act of 2003 (MMA) may be the least understood major piece of health care legislation Congress has ever passed,? writes Jeff Lemieux of Centrists.org. Lemieux offers a detailed analysis and preliminary evaluation of the bill, outlining its main components and key areas of uncertainty, including workability and cost. Lemieux also assesses the prescription drug benefit, private health plan system, and low-income benefits as well as the political evolution of the drug bill. ?Of course, it is impossible to know how private health plans, Medicare administrators, health providers, beneficiaries, Congress and the public will react to unforeseen issues and circumstances many years from now. Nevertheless, an informed speculation is a place to start, and health policy analysts can use [this summary] as a launching pad for more detailed analysis of the likely impact of the new law,? writes Lemieux. Employee Benefit News describes, in the first of a four-part series, the effects of consumer-driven health plans (CDHPs) on insurers, employers, providers, and consumers. Employer interest in plans such as Health Reimbursement Arrangements (HRAs) and Health Savings Accounts (HSAs) is ?up 1,000%,? according to Roger Schulz, senior vice president and director of sales for J. Smith Lanier & Co., an employee benefits broker. Vendors like Definity Health and Lumenos have also had a favorable response to their HRA and HSA plans, but ? [p]erhaps the best proof of the ripple effect CDHPs are having on the health care market is in the product offerings of traditional insurers,? writes Elswick. Seventy-five percent of Blue Cross Blue Shield plans will offer CDHPs by the end of the year, and Aetna, which ?leads the pack of traditional insurers for HRA enrollment,? has seen a four-fold increase in enrollment since January 2003. ? [A]lthough CDHPs still comprise a miniscule slice of total market share, experts say the concept has taken root, forcing traditional insurers to promote the plans and enticing financial institutions to consider entering the market,? writes Elswick. The variety of solutions offered during ?Covering the Uninsured Week? did not get to the ?root of the problem: the continued absence of personal choice and control of health care options,? writes Nina Owcharenko of The Heritage Foundation. Owcharenko suggests two fundamental changes that should be made to the health care system: 1) Fixing the tax treatment of health care by replacing the tax-exclusion for employer-based health insurance with a national system of refundable tax credits; and 2) Designing a consumer-friendly marketplace where consumers are more involved and have more choices of health plans that fit their individual needs. An editorial in The Washington Post argues that putting the focus on the high numbers of uninsured Americans can be misleading if it suggests that our health care crisis can be solved by just extending coverage to all of the uninsured. ? [E]xpanding coverage, whether to the middle classes or the poor, is not sufficient to fix a health care system distorted by spiraling costs and perverse financial incentives; nor, in the long run, is it possible without addressing those issues,? writes the Post. 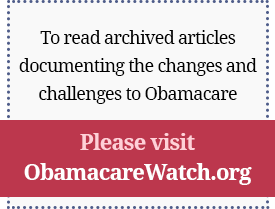 The editorial recommends that true reform will require removing the bias toward employer-paid insurance, making better use of technology to computerize medical records and prescriptions, and considering national catastrophic insurance for the long-term chronically ill. ?It’s time that Americans and their political leaders recognize that there are trade-offs in health care as in everything else and start preparing themselves to make hard choices,? concludes the Post. ?As an ER physician who has run a clinic for the uninsured for the last three years, I applaud ?Cover the Uninsured Week? (CUW) for educating Americans about the plight of these unfortunate citizens,? writes Dr. Robert Berry of the PATMOS EmergiClinic in Greeneville, Tennessee. Dr. Berry treats nearly 2,500 uninsured patients in his practice, offering prices that are more affordable because he has opted out of expensive, paperwork-intensive health insurance plans in his practice. ?As [a doctor] who actually treats the uninsured (as opposed to merely talking about covering them), I have come to realize that health insurance should not cover routine medical care in the same way that car insurance does not cover oil changes or brake jobs,? he writes. ?Such coverage costs too much, delegates power unnecessarily to distant bureaucrats, and causes delays that can only be described as inhumane.? Rising Health Care Costs: Have We Reached the Tipping Point? Wednesday, May 26, 2004, 9:00 a.m.-1:00p.m. For additional details and registration information, go to: http://www.newamerica.net/index.cfm?pg=event&EveID=367. Thursday, May 27, 2004, 10:30 a.m. This event will feature Grace-Marie Turner and Joseph Antos. For additional details and registration information, go to: http://www.heritage.org/Press/Events/ev052704b.cfm. Thursday, June 10, 2004, 9 a.m. – 2:30 p.m.
Additional information and registration information will soon be available.